So... today is the DAY! I’m indefinitely fed up with crickets. The smell. I can’t stand it anymore lol but, also with discoids they offer more nutritional value and protein. I’m ordering my discoids from Joes Bugz I’m gonna get the medium/small ones. That was a good thread to read, I’ll do that if anything. Thank you! it sure is , enjoy ur day too ! Really...Im so glad I have u as a friend!!! Your kind words has made my day...my punishment shall be over soon with old(2014-2017) n comes in as new...i can drop my bucket of water now....and face the whole forum again!! Look up Donna's discoids on fb. 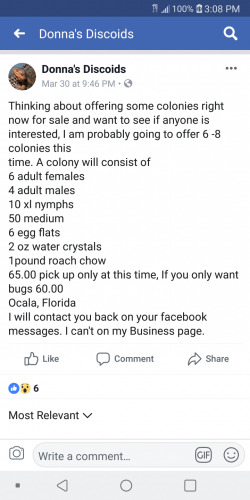 She's up in Ocala area I think. She doesn't ship but not to far up 75 from you.